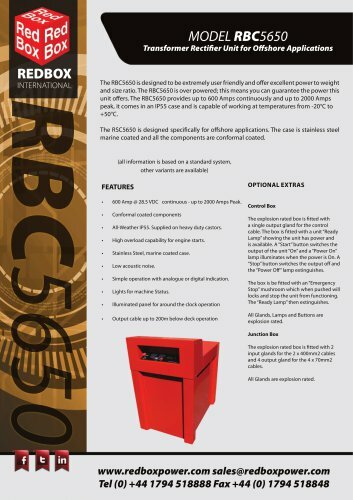 Transformer Rectifier Unit for Offshore Applications REDBOX INTERNATIONAL The RBC5650 is designed to be extremely user friendly and offer excellent power to weight and size ratio. The RBC5650 is over powered; this means you can guarantee the power this unit offers. The RBC5650 provides up to 600 Amps continuously and up to 2000 Amps peak, it comes in an IP55 case and is capable of working at temperatures from -20°C to +50°C. The RSC5650 is designed specifically for offshore applications. The case is stainless steel marine coated and all the components are conformal coated. (all information is based on a standard system, other variants are available) 600 Amp @ 28.5 VDC continuous - up to 2000 Amps Peak. Conformal coated components All-Weather IP55. Supplied on heavy duty castors. High overload capability for engine starts. Stainless Steel, marine coated case. Simple operation with analogue or digital indication. Lights for machine Status. Illuminated panel for around the clock operation Output cable up to 200m below deck operation OPTIONAL EXTRAS Control Box The explosion rated box is fitted with a single output gland for the control cable. The box is fitted with a unit “Ready Lamp” showing the unit has power and is available. A “Start” button switches the output of the unit “On” and a “Power On” lamp illuminates when the power is On. A “Stop” button switches the output off and the “Power Off” lamp extinguishes. The box is be fitted with an “Emergency Stop” mushroom which when pushed will locks and stop the unit from functioning. The “Ready Lamp” then extinguishes. All Glands, Lamps and Buttons are explosion rated. Junction Box The explosion rated box is fitted with 2 input glands for the 2 x 400mm2 cables and 4 output gland for the 4 x 70mm2 cables. All Glands are explosion rated. www.redboxpower.com sales@redboxpower.